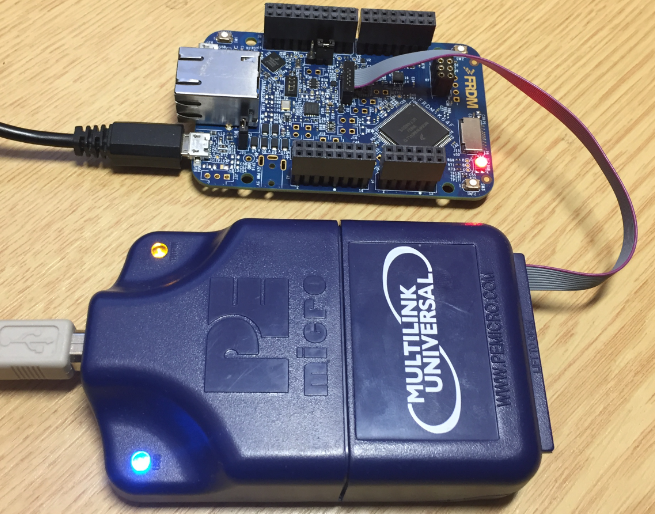 Thanks to a plugin update, anyone debugging an ARM Cortex-M (using FreeRTOS) can see variables while a target is running and have a better view of your threads. 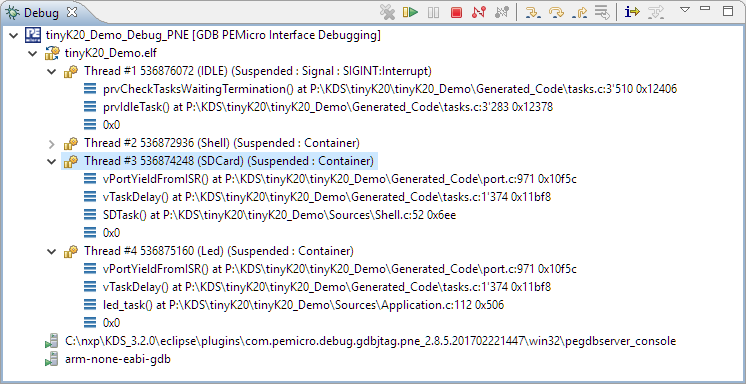 P&E has a new version of their GDB/Eclipse debug plugins available on their Eclipse update site, and it comes with two great features: Real Time Expressions (show variables while the target is running) and FreeRTOS thread awareness. 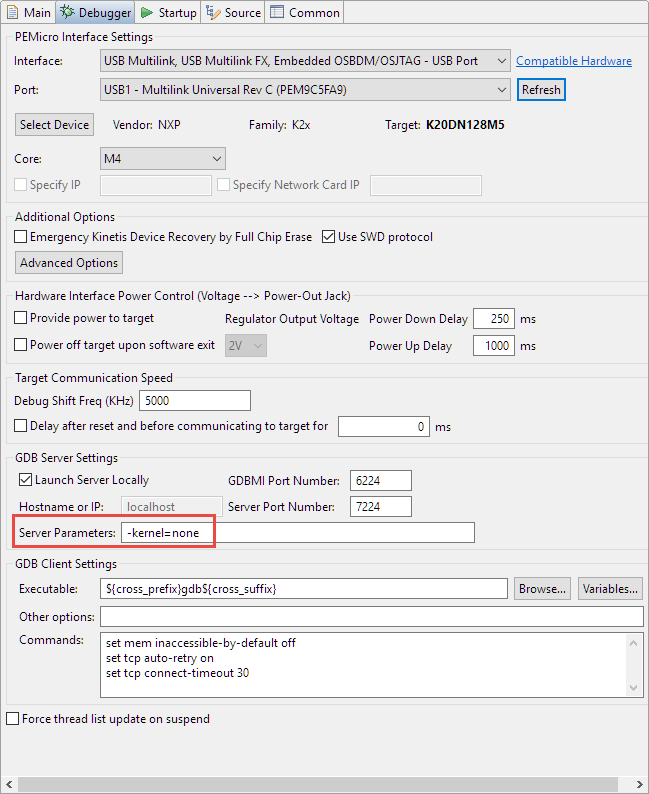 This post is about these two new and great features for P&E-based run control for ARM Cortex-M — and how to install and use these new features. With FreeRTOS as one of the most popular real-time operating systems, there is growing support for it in the industry. 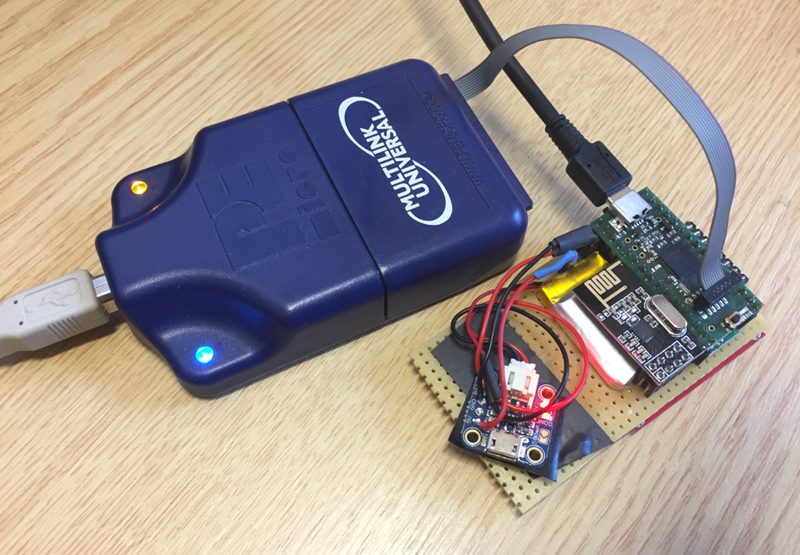 Both OpenOCD and Segger support FreeRTOS thread-aware debugging built into their run control. 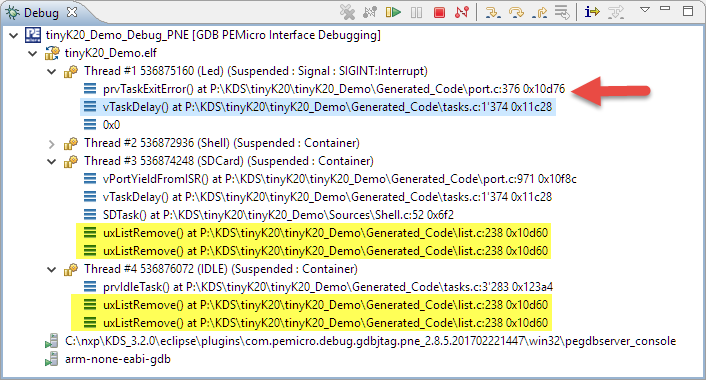 Now P&E has added that too: with this, the gdb/Eclipse thread view shows all the running tasks and it is easy to switch and debug them. But not only that: The other thing with the Freescale/NXP move from CodeWarrior to Kinetis Design Studio is that I have lost CodeWarrior's ability to show/update variables/expressions while the target is running (see Live View for Variables and Memory). Now, this is back in Kinetis Design Studio, or any other similar Eclipse tool, using this new P&E Plugin. The version you are looking for is the 2.8.5 (or later). An earlier version of the plugin available from P&E crashed if configUSE_PORT_OPTIMISED_TASK_SELECTION was set to 0 which I have reported to P&E. The version 2.8.5 works now fine. The update site also lists the E200 plugin, which should not be enabled for ARM/Kinetis development. Click ‘Next’ and go through the usual installation process. Restart Eclipse at the end of the installation. Clicking on a Thread changes the context (stack frame, registers, variables). So with this, I can see and debug all the FreeRTOS threads running. The plugin uses FreeRTOS global variables (e.g. a list of tasks) for thread awareness. This is done automatically in the background. I have not seen any problems with it, but just in case, there is an option in the Eclipse launch configuration to turn it off. I really like the fact that the feature is turned on by default. If I really do not want it (which I think never will be the case) or if there would be any side effects, I still can turn it off. For smaller code, I have usually that macro defined. should instead call vTaskDelete( NULL ). I have used the plugin with FreeRTOS V9.0.0 (McuOnEclipse port) successfully and it works like a charm. I have not tested it with older FreeRTOS versions, but I know for other FreeRTOS-kernel-aware support, e.g. in OpenOCD, it heavily depends on the version of RTOS used. So I recommend that you use the latest RTOS. 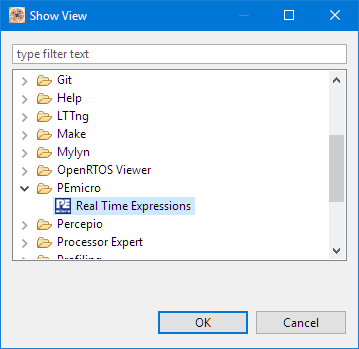 You can find a snapshot of FreeRTOS for ARM Cortex-M as part of the McuOnEclipse Library on GitHub. 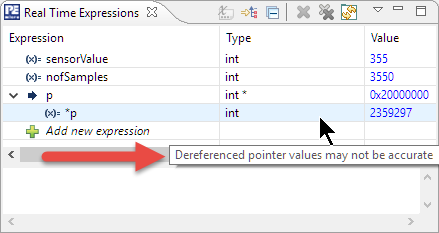 The Real Time Expressions view closes a big gap left with the move from CodeWarrior to Kinetis Design Studio and is really helpful to inspect variables while the target is running.